A few months ago our health insurance finally approved a Dexcom Seven Plus for me. Now that I've been wearing it for just over 2 months, I think I can say that I'm very happy with it! 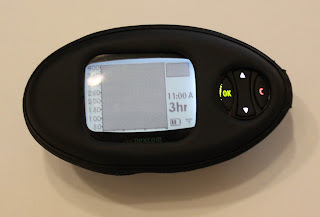 The Dexcom is a continuous glucose monitor (CGM) that has a piece called a transmitter attached to me 24/7. This transmitter is attached to a sensor; a tiny little wire that is stuck in me. 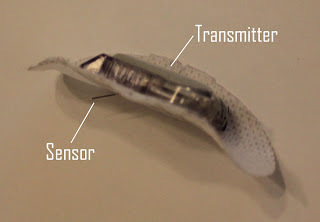 The sensor tells the transmitter what it thinks my blood sugar is and sends it to a receiver. The results are displayed for me to see on the receiver. I can see what it thinks my blood sugar is in the past 3 minutes and I can view graphs of my blood sugar as it has changed over the previous 1, 3, 6, 12, or 24 hours. The Dexcom can be set to alarm if my blood sugar goes over or under certain numbers. Mine is currently set to vibrate then beep if I miss the buzz under 60 mg/dL and over 160 mg/dL. This has been very helpful as my body's needs for insulin during pregnancy are changing quite frequently. The receiver has woken me up on multiple occasions to catch a quickly dropping blood sugar. I can also download all the data from the receiver to our computer and see reports including hourly averages and multiple day graphs stacked on one another. The only thing I find a little frustrating about the transmitter/sensor attachment is that the adhesive tends to wear out faster than the sensor. I can wear it for 7 days without a problem, but by 9-10 days, the stick-em is pretty much gone. I like to wear them as long as possible because it gets more accurate after the first 24 hours, so the more good data I can get, the better! I'm looking forward to continuing to decrease my HBA1C test (3 month blood sugar average) now that I can keep myself in tighter boundaries. It took a while for our insurance to approve this, even though it will improve my health and decrease diabetic complications long-term. 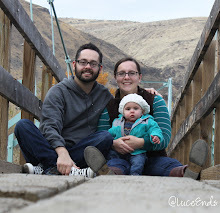 After my endocrinologist's initial request, it took a second letter from him, pregnancy, a letter from myself, and a letter from my doctor at the maternal fetal medicine clinic. Very worth it! That is awesome! Pays to be persistent. We have been praying for you guys. So glad to hear the new monitor is working out and being so helpful!